Believe it or not, I lost my running shoes.Â I am not sure where I misplaced it.Â I must have thrown it to the garbage bin because when I go to the gym, I wrap it in plastic.Â I must have thought it was trash and threw it away @[email protected]Â Anyway, it almost hindered me from achieving my goal â€“ to finally get a gym membership.Â I mean, how can you go to the gym without shoes? Vince and I went to Vivere Salon in Robinsonâ€™s Place Ermita and while he was still getting his hair cut, I roamed around looking for shoes.Â I got so excited of finally going to the gym and I bought these shoes even if it is a bit out of my budget.Â I am not entirely sure, but they seem to sell shoes at the department store more cheaper than the one in a boutique.Â I went to one and compared the prices, the boutique was selling it at Php 5,000 ++ while I bought this for only P 4,300.Â It still supposedly is out of my budget but since I donâ€™t want to have any excuse not to go to the gym and since I need a good shoes for training (running and gym) I decided to buy it in a snap! The shoes are meant for training.Â They shaped the foot sole to have diamond clusters for flexibility and adaptability to whatever activity I am conducting.Â You can also plug in your Nike Plus if you have one and since I donâ€™t have one, I am planning to buy I also have an iPod nano that supports Nike Plus with that application on the net so that definitely is on my to-buy list. I was likeâ€¦ waitâ€¦ does that number â€œ5â€ mean itâ€™s a size 5??? 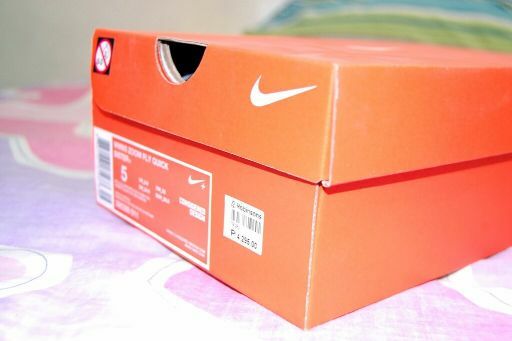 I donâ€™t really know how they put those sizes on the boxes and what not but I was pretty sure I was a size 6!Â Â Actually, 5 and a half to be exact, but I usually get the size 6. That explained why the shoes were a little bit uncomfortable.Â I was so FRAZZLED then because I asked the sales clerk a thousand times if they were size 6 because it was a little bit tight on my feet!Â I swear I remembered the sales clerk looking at the box to check and looked at me straight and said â€œyes maam, size 6 po itoâ€ try no nalang ulit ito. I tried it again, it fit just right like exactly right â€“ no allowance or what not! The sales clerk who sold me the shoes wasnâ€™t there.Â Instead, other sales guys from Nike were there.Â They confirmed â€“ it is a size 5! @[email protected] I told them what happened and they were so apologetic.Â I know it wasnâ€™t their fault so I didnâ€™t give them any attitude.Â I was just happy that I could return it â€“ thank GOODness!Â Turns out, they didnâ€™t have any stock of size 6 anymore!Â I was a bit furious and I said â€œBakit naman magsisinungaling yon sa akin?â€ (Why would he lie about the shoe size? )Â I was a bit pissed because I wanted that design so bad but I canâ€™t wear a size 5 nor a 7â€¦ and they didnâ€™t refund neither.Â I donâ€™t know if you can actually do â€“ well there was a little bit of â€œfraudâ€ there right?Â I was fooled!Â Therefore, the contract of sale is supposedly did not happen â€¦ but I was at fault to because one condition for the contract to be null is that the other party (me) exercised due diligence to make sure the sale was legit.Â I didnâ€™t check for myself what size it was! So guys, remember to check the size of the shoes yourselves!Â Check both shoes you donâ€™t want the other to be smaller or bigger than the other one, do you? ei did you check if it’s the right shoe for your foot type? I mean it really helps to wear the correct shoe type if you’re gonna use it for running. i remember buying an adidas adizero because it was too light and comfy but i can’t use it for running over long period of time because my sole will start to hurt. turns out i wasn’t wearing the correct shoe for my foot type (overpronation, low arch). The big they do is keep your feet from slipping. I know when I steartd to play and wore sneakers, my feet slipped all the time. And I don’t think that was helping my swing.The greatest benefit I find is on the tee, but depending on where you’re standing in the fairway or the rough, having a firm grip of the ground can prove invaluable there as well. Particularly if you really have to swing hard to get out of trouble.Of course, if the shoes you’re wearing now are providing the traction you need and they’re not damaging the golf course (the greens in particular), then save the money and get yourself something else for Christmas.In the end, it’s all about getting solid footing. Other than that, there’s no real magic in the shoes the rest of the shot is up to you.Good luck! !